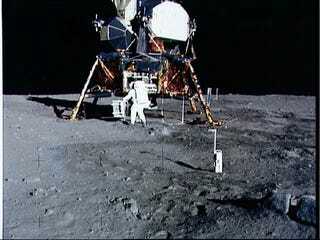 Forty-five years ago today, humans first stepped foot on the moon. You've been entrusting me with your memories all week, reliving the excitement or laughing at your childhood indifference. Read what we've collected, and share your story of the Apollo 11 lunar landing. 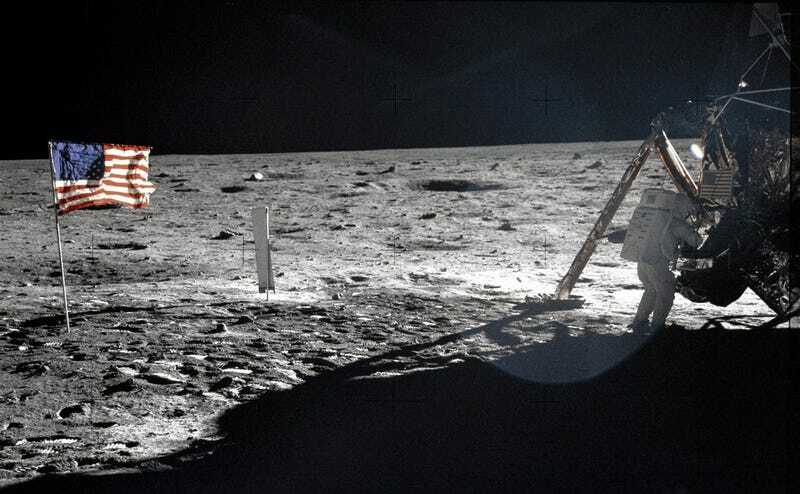 4:18 pm Eastern Daylight Time, on Sunday July 20th, 1969, Neil Armstrong landed the Eagle lunar lander on the Sea of Tranquility as part of the Apollo 11 mission. Hours later at 10:56 pm, he stepped down to the moon, creating a moment of history. Does this pivotal moment look sharper than you remember? The original footage was shot in higher definition than broadcast television could handle at the time. NASA's been working to restore the archival footage to the highest quality possible. All week, we've been running stories on the Apollo 11 mission, the launch, and even the language we use when describing it. You've been returning the favour by telling us your stories of what you remember, or what your parents saw, or your friend's stories of where they were when when we became the first creatures to reach beyond our planet to stride across another world. Is This a Footprint, or Bootprint? Trike was at that critical age of being old enough to watch, but young enough to not actually remember Apollo 11. Yet the landing clearly had an impact on the family: a new dog acquired just before the landing proudly bore the name Eagle in honour of the lunar module. I was 7. As was her custom, my mom woke us up for the launch, which was early on the West Coast. When the LM landed, they showed a paper cut-out. It was labeled "animation," which was a word I didn't know. The neighbor lady said it was like Donald Duck. This was no help. The animation of Terry Gilliam still reminds me of that moment. When the television pictures began, the image of Neil climbing down looked like a ghost to my little brother. He hid is eyes, which annoyed my father as these things only happened, "once in a million years." I remember hearing the famous botched-phrase, "One small step for man, one giant-leap for mankind," which I though sounded really cool. And I still think it sounds better without the missing indefinite pronoun. This confusion was a reoccurring theme — Ratz was the same age during the launch and utterly unimpressed that reality failed to meet the expectations raised by a steady diet of scifi, while a 4-year-old Anemone tried to coax a channel-flip to colourful and exciting cartoons. I was 5. Everyone crowded around our tiny TV, and were tense, then absolutely erupted at The Moment. I was surprised that they made such a fuss. After all, they SAID they were going there, they had been working on it for more than my lifetime, why was everyone so surprised? My father got very quiet and very emotional: verklempt, I think the word is. I watched it on a portable black and white TV. It was damn awesome. Here's another document from that time — my dad, my brother and I listening to the Apollo 11 launch on an AM radio as our family was canoeing in Canada. We used the aluminum canoe as an antenna to boost the radio signal. As soon as the rocket was aloft, we raced home, halfway across the continent, in time to watch man land on the moon. Reading all your stories has been making me all misty-eyed and nostalgic for a moment of shared excitement, tension, anticipation, and relief that I wasn't alive to experience. I don't have my own memory to share. But I do have my mother's. Curiosity and wonder is highly valued in my family. My grandfather would wake his children up for aurora, meteor showers, eclipses, and more, shepherding them outside in their pyjamas to huddle under a blanket and stargaze in awe. On this night, nearly half a century ago, he gathered them up not to go outside, but to cluster around the television. Those hours of tests and checks and safety procedures between landing and leaping meant that it was almost bedtime — past it, for the youngest of them — when Neil Armstrong took that small step, but everyone stayed up to watch it together. My mother's memory is a mix of crystal clear and hazy. We had to do the math to backtrack how old she must have been, but she remembers the sticky, warm summer night. She remembers the immortalized quote with scratchy bursts of static, her father's quiet awe, and not much else. It's cherry season where she grew up; she probably spent the weekend sailing or hunting for the legendary lake monster before picking fruit in the orchards the next day. Weeks later, a plane would break the sound barrier while flying too low over her hometown, shattering glass with its sonic boom. Humans broke into a space age with Sputnik and the Explorer probes, and again with Yuri Gagarin and Alan Shepard. But once Neil Armstrong and Buzz Aldrin landed on the moon, Michael Collins watching from above, we entered into space culture. My mother and I are pre- and post-, a pair straddling this moment in history. Asking her to tell me about the day we landed on the moon was a weird feeling — rationally I knew my history was her memory, yet actually collecting the story made this all more real, taking an unreal moment in time and drawing a story through time to connect it to my daily life. For me, we are creatures who have always left this planet, traveled to space, walked on the moon, lived in orbit, a countless other criteria each amazing and astonishing and astounding on their own coming together to create a reality that is so incredible that it inspires endless stories building on its wonder. It's easy to get blasé — we haven't gone back to the moon since the Apollo program, commercial spaceflight is getting downright predictable, even our robotic explorers keep operating absurdly long after their anticipated lifespans. And yet it is so incredible, so unbelievable, so implausible that hordes of self-destructive, short-sighted humans could reach for the stars, and succeed. Today's a day to recapture that wonder. Tell me your stories — your memories, or the memories that have been entrusted to you by others. Where were you when we landed on the moon? If you're like me and weren't yet alive in 1969, take today to seek out someone who was. Ask them what it was like, their memories, their emotions on that day. It's a powerful moment for them to remember, and for you to take on that memory, ensuring the story lives on.